The major histocompatability class II heterodimer (class II) is expressed on the surface of both resting and activated B cells. Although it is clear that class II expression is required for Ag presentation to CD4+ T cells, substantial evidence suggests that class II serves as a signal transducing receptor that regulates B cell function. In ex vivo B cells primed by Ag receptor (BCR) cross-linking and incubation with IL-4, or B cell lines such as K46-17μmλ, class II ligation leads to the activation of protein tyrosine kinases, including Lyn and Syk and subsequent phospholipase Cγ-dependent mobilization of Ca2+. In this study, experiments demonstrated reciprocal desensitization of class II and BCR signaling upon cross-linking of either receptor, suggesting that the two receptors transduce signals via common processes and/or effector proteins. Because class II and BCR signal transduction pathways exhibit functional similarities, additional studies were conducted to evaluate whether class II signaling is regulated by BCR coreceptors. Upon cross-linking of class II, the BCR coreceptors CD19 and CD22 were inducibly phosphorylated on tyrosine residues. Phosphorylation of CD22 was associated with increased recruitment and binding of the protein tyrosine phosphatase SHP-1. Similarly, tyrosine phosphorylation of CD19 resulted in recruitment and binding of Vav and phosphatidylinositol 3-kinase. Finally, co-cross-linking studies demonstrated that signaling via class II was either attenuated (CD22/SHP-1) or enhanced (CD19/Vav and phosphatidylinositol 3-kinase), depending on the coreceptor that was brought into close proximity. Collectively, these results suggest that CD19 and CD22 modulate class II signaling in a manner similar to that for the BCR. The MHC class II heterodimer (class II)3 is expressed at high levels on the surface of activated B cells. Although class II is involved in the presentation of Ag to CD4+ T cells, numerous studies have demonstrated that class II plays an important role as a signal transducing receptor as well (1, 2). Class II-mediated signals affect Ag presentation, cell-cell adhesion, cytokine production, and the expression of costimulatory molecules (3, 4, 5, 6, 7, 8, 9, 10, 11, 12). Additionally, ligation of class II has been shown to mediate apoptosis as well as proliferation/differentiation of B cells (13, 14, 15, 16, 17). Ligation of class II has clearly been shown to exert a significant effect on the biology of B cells through the activation of two distinct signal transduction pathways. In quiescent murine B cells, cross-linking of class II causes an elevation of cAMP and subsequent translocation of protein kinase C (PKC) to the nucleus (18, 19, 20, 21, 22). Alternatively, in murine B cells that have been primed by stimulation through the B cell Ag receptor (BCR) and IL-4 receptor, cross-linking of class II has been shown to up-regulate the activity of the Src family protein tyrosine kinase (PTK) Lyn and the non-Src family PTK Syk (23, 24, 25). Together, these PTKs mediate activation of phospholipase Cγ (PLCγ), leading to the production of inositol 1,4,5-trisphosphate (IP3) and diacylglycerol, which mediate Ca2+ mobilization and activation of PKC, respectively (23, 24, 25). In human B cells, ligation of class II mediates the activation of both pathways as well (26, 27, 28, 29); however, the ability of class II to couple to the PTK-dependent signaling pathway does not appear to require prior activation of the cells (26, 27, 28, 29). Thus, it is apparent that class II signaling is mediated by many of the same effector proteins that are involved in BCR-dependent signal transduction. Furthermore, recent studies have demonstrated that class II-dependent activation of the PTK signaling pathway is regulated by CD45 in a manner similar to that observed in BCR-dependent signaling (24). Additional similarities exist between class II- and BCR-mediated signal transduction with regard to the structural requirements for coupling to downstream PTKs. Studies have demonstrated that the ability of class II to mediate PTK activation is dependent on motifs contained within the transmembrane/extracellular region of the α- and/or β-chains of the molecule (1, 25, 28, 29, 30, 31). Thus, it has been hypothesized that class II, like the BCR, relies on interactions with other transmembrane proteins to form a competent signal transducing complex. Recent studies have shown that the ability of class II to activate PTKs is dependent on its recruitment to membrane rafts (32). Presumably, class II recruitment to membrane rafts results in its localization to specific microdomains in the plasma membrane that are enriched in Src family PTKs, and which contain one or more intermediate transducer proteins that mediate class II signal transduction. Because class II and BCR signaling pathways share numerous similarities, studies were conducted to determine whether class II signaling is subject to regulation by coreceptors in a manner similar to that for the BCR. CD19 and CD22 are coreceptors that have been shown to modulate signal transduction via the BCR (33, 34) and were therefore chosen as candidates that might regulate class II signaling. CD19 is a member of a multimeric complex comprised of CD21, CD81, and Leu-13 and has been shown to enhance signaling via the BCR (35, 36, 37, 38). Tyrosine phosphorylation of the cytoplasmic domain of CD19 generates phosphotyrosine motifs that recruit Vav and phosphatidylinositol 3-kinase (PI 3-K), as well as other effector proteins (39, 40, 41). CD22 is a B cell-restricted, 140-kDa glycosylated transmembrane protein that is inducibly phosphorylated on tyrosine in response to BCR ligation. Phosphorylation of CD22 mediates the recruitment of several effector proteins including PLCγ, PI 3-K, Syk, and the protein tyrosine phosphatase (PTP) SHP-1 (42, 43, 44). Recruitment and activation of SHP-1 by CD22 has been demonstrated to attenuate signal transduction through the BCR (45, 46, 47). In this study, CD19 and CD22 were observed to become tyrosine phosphorylated following class II ligation, resulting in the recruitment of specific effector proteins. As a result, signaling was influenced either negatively (CD22/SHP-1) or positively (CD19/Vav and PI 3-K) when class II was coligated with these coreceptors. Collectively, the results obtained suggest that CD19 and CD22 can modulate class II- and BCR-dependent signaling in a similar manner. C57BL/6 mice were obtained from The Jackson Laboratory (Bar Harbor, ME). All experiments were performed using mice between the ages of 6 and 8 wk. The mAbs used in these studies were: D3.137.1 (rat IgG2a, anti-mouse MHC class II, Iad,b haplotype), Bet-2 (rat anti-mouse μ heavy chain), B76 (rat IgG1, anti-mouse μ heavy chain), RG7/9.1 (mouse IgG2b, anti-rat κ light chain), and CY34.1 (mouse IgG1, anti-mouse CD22). The mAbs were purified using protein G-Sepharose 4B fast flow beads (Amersham Pharmacia Biotech) and were biotinylated using N-hydroxy-succinimidobiotin (Sigma, St. Louis, MO) as described previously (48). The Abs PTP1C (mouse IgG1, anti-SHP-1; Transduction Laboratories, Lexington, KY), 1D3 (rat IgG2a, anti-mouse CD19; PharMingen, San Diego, CA), PE-conjugated CY34.1 (mouse IgG1, anti-mouse CD22.2; PharMingen), anti-Vav (mouse anti-human Vav; Upstate Biotechnology, Lake Placid, NY), anti-PI 3-K (mouse IgG1, anti-human PI 3-K; Transduction Laboratories), anti-IgG/A/M (F(ab′)2 goat anti-mouse IgG, IgA, IgM; Organon Teknicka, West Chester, PA), and 4G10 coupled to HRP (mouse IgG2b, anti-phosphotyrosine; Upstate Biotechnology) were purchased for these studies. Dr. Robert Carter (Department of Medicine, University of Alabama at Birmingham, Birmingham, AL), generously provided mouse anti-CD19 cytoplasmic domain mAb. The secondary Abs used in these studies included goat anti-mouse IgG coupled to HRP and goat anti-rabbit IgG coupled to HRP (Biosource International, Camarillo, CA). Additional reagents used in these studies included NeutrAvidin (Pierce, Rockport, IL) and streptavidin conjugated with PE (Biosource International). Mouse IL-4 was purchased from R&D Systems (Minneapolis, MN). Resting splenic B cell were purified as previously described (23). Briefly, after preparing a single cell suspension of splenocytes, RBC were lysed using Gey’s solution, T cells were depleted by complement-mediated lysis, and high density B cells (>1.079 g/ml) were isolated by centrifugation through a discontinuous Percoll gradient (Amersham Pharmacia Biotech). The B lymphoma cell line K46-17μmλ (K46) was provided by Dr. Michael Reth (Max-Planck Institut fur Immunbiologie, Frieburg, Germany). K46 cells were cultured in IMDM supplemented with 5% FBS (HyClone, Logan, UT), 2 mM l-glutamine, 50 μm 2-ME, 100 μg/ml streptomycin-penicillin, and 50 μg/ml gentamicin (Sigma, St. Louis, MO) at 37°C under 5% CO2. MHC class II and BCR-mediated signaling events were analyzed following stimulation of cells with the respective mAbs as described below. To analyze MHC class II mediated signaling, K46 cells were harvested and resuspended in IMDM with 5% FBS (2.5 × 107/sample). Samples were then incubated with biotinylated anti-class II mAb (D3.137.5.7, 20 μg/ml) for 15 min at room temperature. The cells were washed once in room temperature PBS, resuspended in IMDM with 5% FBS (1 ml/sample), and allowed to equilibrate for 15 min at 37°C under 5% CO2. Next, the cells were stimulated for various times with NeutrAvidin (20 μg/ml). Stimulation of cells with either anti-class II mAb or NeutrAvidin alone did not elicit a signaling response as determined by measurement of calcium mobilization (data not shown). The effect of signaling through class II was compared with that observed when cells were stimulated through the BCR (goat anti-mouse IgG/A/M F(ab′)2, 5 μg/ml), or with pervanadate. For consistency, cells stimulated through the BCR or with pervanadate were handled in the same manner as those stimulated with anti-class II mAb and NeutrAvidin. After stimulation, samples were washed twice in 7 ml of ice-cold PBS and lysed in 0.5 ml of lysis buffer (25 mM HEPES, 150 mM NaCl, pH 7.8, 10 mM EDTA, 1 mM EGTA, 0.1 mM Na3V04, and 1% Nonidet P-40). Cells were lysed for 1 h on ice, and the lysates were centrifuged at 12,000 × g for 15 min at 4°C to remove debris. Lysates were precleared by incubation with protein G-Sepharose beads (Vav, PI 3-K, SHP-1, and CD19 experiments) or RG7/9.1 bound to Sepharose-4B beads (CD22 experiments) for 1 h at 4°C to minimize nonspecific protein binding. Proteins of interest were immunoprecipitated from precleared lysates either by the addition of soluble Abs followed by the addition of protein G-Sepharose beads (Vav, PI 3-K, CD19, SHP-1) or by the addition of Ab coupled directly to Sepharose 4B beads (CD22). Each immunoprecipitation step was performed for 1 h at 4°C with rotation. Immune complex-coated beads were collected and washed four times with lysis buffer containing 0.2% Nonidet P-40. The beads were resuspended in 50 μl of reducing SDS-PAGE sample buffer, boiled for 5 min, and centrifuged at 12,000 × g for 5 min. For each condition, the proteins contained in 15 μl of SDS-PAGE sample buffer were separated on 8% acrylamide gels using SDS-PAGE and were transferred to Hybond-ECL nitrocellulose membranes. The membranes were blocked in either 3% blot qualified BSA (Promega, Madison, WI; CD22 and CD19) or 10% nonfat dry milk in TBST (Vav, PI 3-K, SHP-1) for 1 h at room temperature. The membranes were then washed five times with TBST. To detect inducible tyrosine phosphorylation of CD22 and CD19, blots were incubated with anti-phosphotyrosine (PTyr) mAb (1:3000, 4G10-HRP) for 1 h at room temperature. The blots were washed in TBST and incubated with streptavidin conjugated to HRP (1:10,000) for 1 h at room temperature. Tyrosine phosphorylation of CD19 and CD22 was visualized using enhanced chemiluminescence (ECL) according to the manufacturer’s instructions (Super Signal chemiluminescent substrate; Pierce). To detect binding of SHP-1 to CD22, or Vav and PI 3-K to CD19, the appropriate blots were stripped by incubating them in stripping buffer (10 mM Tris, pH 2.3, 150 mM NaCl) at 70°C for 1 h, after which they were washed repeatedly in TBST. The membranes were then blocked in 10% nonfat dry milk in TBST for 1 h at room temperature, washed extensively in TBST, and incubated with anti-SHP-1 mAb (1:250), anti-Vav Ab (1:250), or anti-PI 3-K Ab (1:300) for 1 h at room temperature. Each blot was washed in TBST and incubated with HRP-conjugated goat anti-mouse IgG (1:10,000) for 1 h at room temperature. The membranes were then washed and developed using ECL to visualize binding of effector proteins. In select CD19 experiments, membranes were stripped and reprobed with mouse anti-CD19 cytoplasmic tail mAb followed by the addition of HRP-conjugated goat anti-mouse IgG to confirm equal recovery and loading of CD19. Either splenic B cells or K46 cells (1 × 106/ml) were loaded with Indo-1 AM at a final concentration of 5 μm. Indo-1-loaded cells were analyzed using a Becton Dickinson FACSvantage flow cytometer (San Jose, CA) equipped with an Enterprise laser from Coherent (Santa Clara, CA) set for excitation at ∼364 nm at a power setting of 60 mW. Fluorescence emissions were separated by a 505-nm short pass beam splitter into two component emissions by passage through 405- and 485-nm centered 10-nm band pass filters to detect violet and blue, respectively. The ratio of emissions was calculated, and a plot was constructed of fluorescence ratio vs time. Before analysis, cells were incubated with biotinylated anti-class II mAb (D3.137, 5 μg/ml) for 15 min at room temperature in the presence or absence of either biotinylated anti-CD22 mAb (Cy34.1, 1–20 μg/ml) or biotinylated anti-CD19 mAb (1D3, 1–20 μg/ml). Additional samples were incubated with biotinylated anti-CD19 mAb (1D3, 20 μg/ml) alone, as described above. All samples were washed, and the baseline level of intracellular free calcium was established. Once the baseline was measured NeutrAvidin (20 μg/ml) was added to coligate the appropriate receptors, after which the analysis was resumed. K46 cells (1 × 106/ml) were loaded with Indo-1 AM at a final concentration of 5 μm. Analysis of class II-mediated and/or IgM-mediated Ca2+ mobilization was performed as described previously (37). Before analysis, cells were incubated with biotinylated anti-class II mAb (D3.137, 20 μg/ml) for 15 min at room temperature, then washed. To measure BCR-mediated desensitization of class II signaling, anti-class II coated cells were analyzed using flow cytometry as previously described to establish the baseline level of intracellular free Ca2+. Once the baseline had been measured, anti-IgM mAb (B.76, 15 μg/ml) was added to the cells and the analysis resumed. After the response to BCR cross-linking had returned to baseline, NeutrAvidin (20 μg/ml) was added to the same sample. Additional samples, prepared as previously described, were analyzed to determine whether class II ligation leads to desensitization of BCR signaling. For these experiments, cells were analyzed to determine the baseline level of free intracellular Ca2+ after which they were stimulated by first cross-linking the biotinylated anti-class II mAb (D3.137.1, 20 μg/ml) with the addition of NeutrAvidin (20 μg/ml). 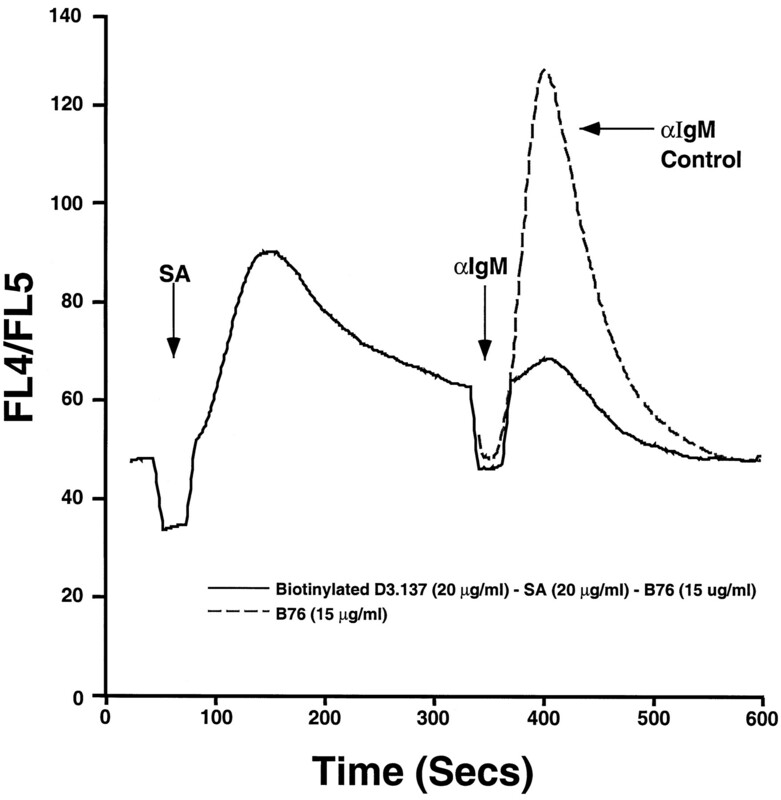 After the response had returned to baseline, the same cells were stimulated via the addition of anti-IgM (B76, 15 μg/ml) and then analyzed immediately. The studies presented in this paper used the K46 B lymphoma cell line to examine MHC class II signaling. This cell line is representative of an activated B lymphocyte in that cross-linking of class II leads to PTK activation and calcium mobilization in the absence of priming signals, such as anti-Ig mAb and IL-4 (24, 25). Because signaling through class II has previously been shown to involve the activation of effector proteins that are common to the BCR signal transduction pathway (23, 24, 25), studies were designed to determine whether stimulation through the BCR desensitizes class II signaling. K46 cells loaded with the calcium-sensitive dye Indo-1 were preincubated with biotinylated anti-class II mAb (D3.137.1, 20 μg/ml). Next, the baseline concentration of free intracellular Ca2+ was established for each sample, and the cells were stimulated by the addition of anti-IgM mAb (B76, 15 μg/ml), after which the analysis was resumed immediately. 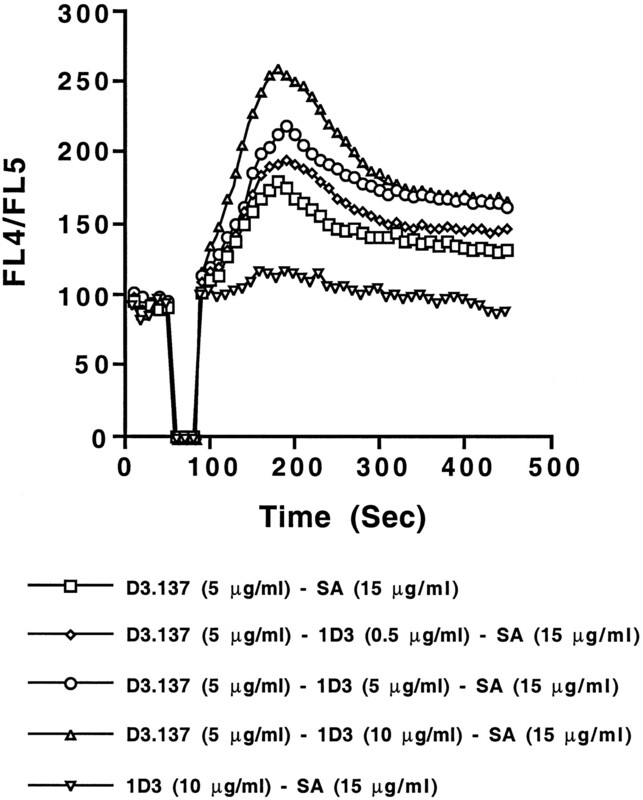 The response to BCR cross-linking consistently generated a large calcium flux response (Fig. 1⇓). Once the response had returned to baseline, the same cells were restimulated by the addition of NeutrAvidin to cross-link class II receptors bound with biotinylated anti-class II mAb. Subsequent analysis of the cells failed to detect a significant calcium mobilization response after class II ligation. When compared with the normal calcium mobilization response elicited by class II ligation alone, it was clear that signaling had been attenuated by prior cross-linking of the BCR (Fig. 1⇓). BCR-dependent signal transduction mediates desensitization of class II. K46 cells (1 × 106/ml/sample) were loaded with Indo-1 AM at a final concentration of 5 μM. 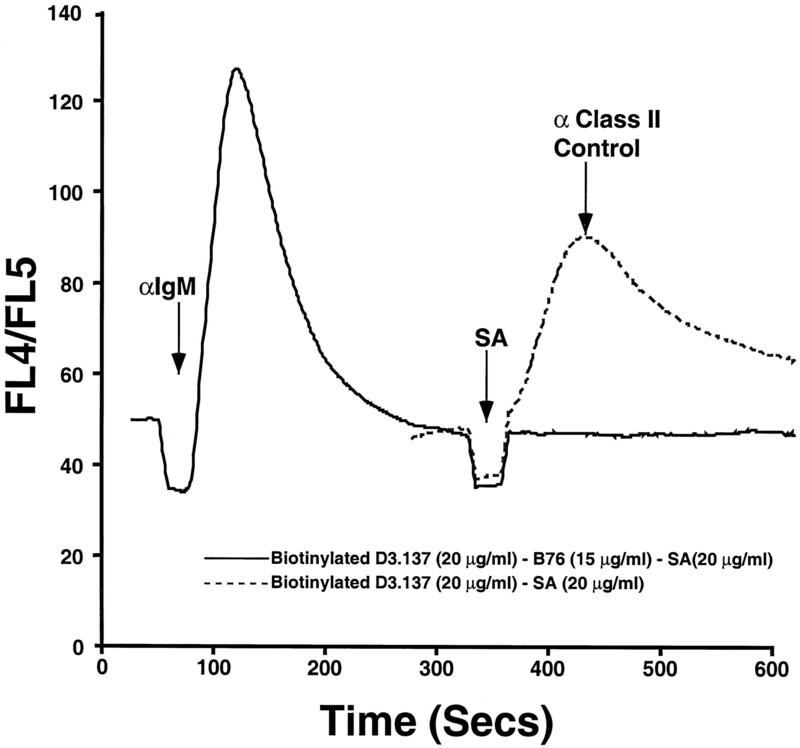 Before analysis, cells were incubated with biotinylated anti-class II mAb (D3.137, 20 μg/ml), washed, and the basal concentration of free intracellular Ca2+ established. Next, anti-IgM mAb (B76, 15 μg/ml) was added to the sample and the analysis resumed. After the concentration of free intracellular Ca2+ returned to baseline, the same cells were restimulated through class II by adding NeutrAvidin (20 μg/ml), after which the analysis was continued. The solid line represents the calcium mobilization response obtained when cells were treated as described above. The dashed line represents the calcium mobilization response observed by stimulating K46 cells with biotinylated anti-class II mAb and NeutrAvidin in the absence of prior BCR cross-linking. Additional experiments were conducted to demonstrate the reciprocal desensitization of BCR signaling in response to cross-linking of class II. K46 cells were loaded with Indo-1 and preincubated with anti-class II mAb. Measurements to establish the Ca2+ baseline in unstimulated cells were taken, after which the cells were stimulated by ligating class II through the addition of NeutrAvidin. The analysis was resumed immediately to monitor the calcium mobilization response. After the level of free intracellular Ca2+ returned to baseline, the same cells were restimulated by the addition of anti-IgM mAb to cross-link the BCR (Fig. 2⇓). A modest calcium mobilization response was observed in repeated experiments. When compared with the calcium flux normally observed following stimulation of the K46 cells via the BCR, it was evident that desensitization of BCR-mediated signaling had occurred. The data indicate that significant “cross-talk” takes place between class II and the BCR. The specific mechanism responsible for desensitization of one receptor by the other remains unclear, but does not appear to be due to depletion of intracellular Ca2+stores or inhibition of Ca2+ influx as determined by the addition of thapsigargin to cells that had previously been stimulated through either the BCR or class II (Fig. 3⇓). MHC Class II-dependent signal transduction leads to desensitization of the BCR. K46 cells (1 × 106/ml/sample) were loaded with Indo-1 AM at a final concentration of 5 μM. 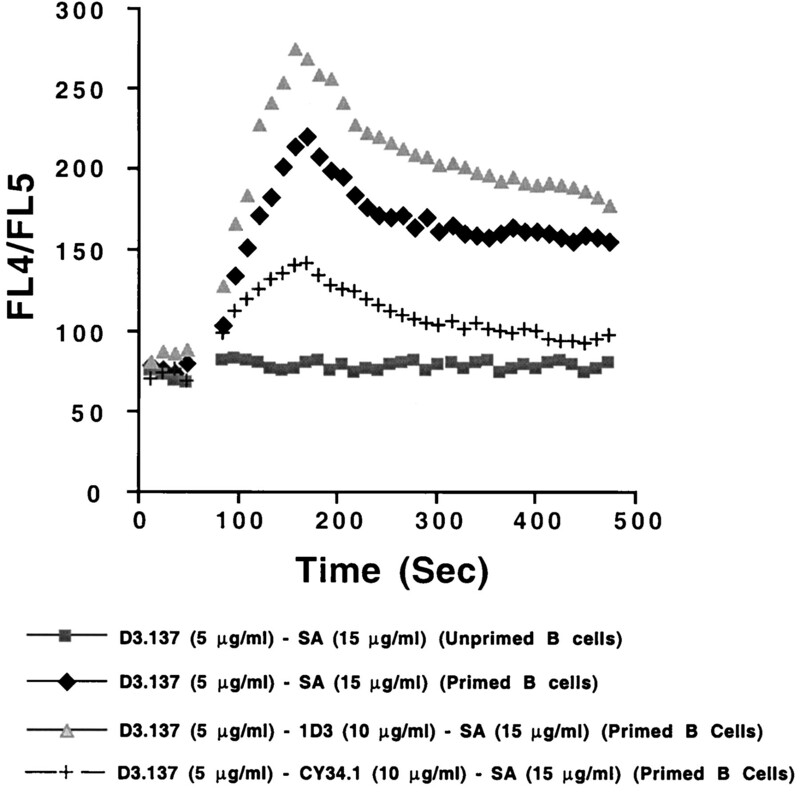 Before analysis, cells were incubated with biotinylated anti-class II mAb (D3.137, 20 μg/ml), washed, and the basal concentration of free intracellular Ca2+ established. The analysis was stopped, NeutrAvidin (20 μg/ml) was added to cross-link class II and the analysis was resumed. After the concentration of free intracellular Ca2+ returned to baseline, the cells were stimulated by the addition of anti-IgM mAb (B76, 15 μg/ml). The solid line represents the calcium mobilization response obtained when cells were treated as described above. The dashed line represents the calcium mobilization response observed for K46 cells stimulated through the BCR without prior cross-linking of class II. Desensitization of BCR- and class II-dependent signaling is not mediated by depletion of intracellular Ca2+ stores or inhibition of Ca2+ influx. K46 cells (1 × 106/sample) were loaded with indo-1 and were stimulated either through the BCR or class II as described previously. Subsequently, the cells were incubated for 15 min at 37°C before flow cytometric analysis to establish the concentration of free intracellular Ca2+. As a control, cells were incubated in medium alone for 15 min at 37°C before flow cytometric analysis. 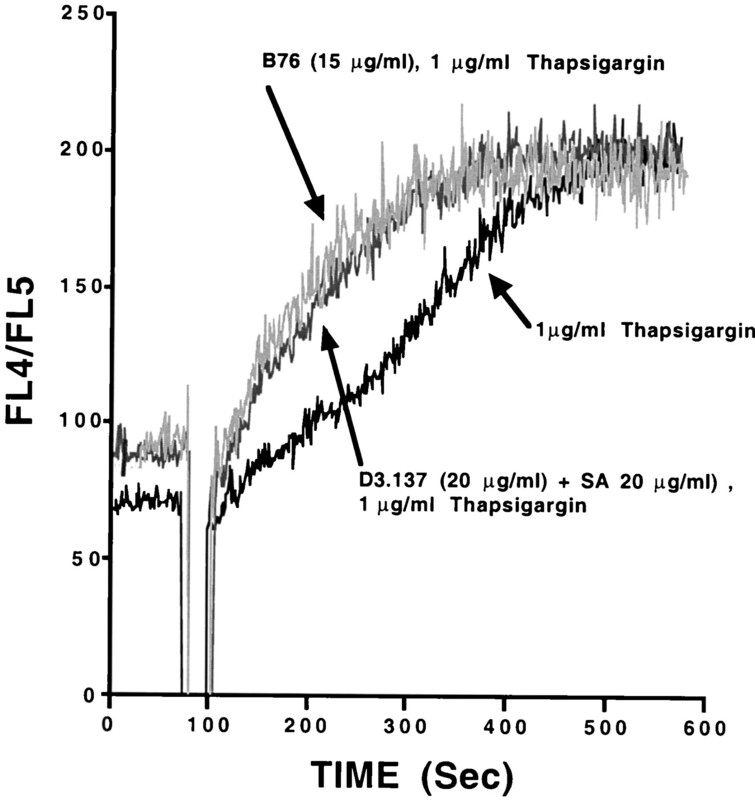 After the baseline concentration of Ca2+ had been established the analysis was stopped, 1 μg/ml thapsigargin was added to the cells, and the analysis was immediately resumed. Based on the finding that class II and the BCR exhibit the ability to reciprocally desensitize one another, and therefore presumably use similar signaling pathways, it was of interest to determine whether class II signaling is regulated by coreceptors in a manner similar to the BCR. Because CD19 and CD22 have been shown to regulate signals transduced through the BCR in either a positive or negative manner, respectively (33, 34, 49), experiments were conducted to determine whether these coreceptors modulate signals transduced by class II. K46 cells were stimulated by incubation with biotinylated mAb against class II followed by the addition of NeutrAvidin. Alternatively, cells were stimulated by the addition of anti-mouse IgG/A/M polyclonal Ab to cross-link the BCR. To detect activation-dependent phosphorylation of CD22, experiments were performed in which CD22 was immunoprecipitated from cell lysates using Sepharose 4B beads conjugated to anti-CD22 mAb (NIMR-6). The resultant immune-complexes were resolved by SDS-PAGE and were analyzed by Western blotting with an anti-phosphotyrosine mAb. Tyrosine phosphorylation of CD22 was observed within 1 min in K46 cells stimulated by BCR ligation (Fig. 4⇓). Class II cross-linking resulted in increased protein tyrosine phosphorylation of CD22 as well, and the response exhibited kinetics that were similar to those for BCR-dependent phosphorylation. In parallel experiments, cell lysates were incubated with soluble anti-CD19 mAb, and the resultant immune-complexes were recovered by incubation with protein G-conjugated Sepharose beads. The proteins were resolved by SDS-PAGE and analyzed by anti-phosphotyrosine Western blotting. As expected, CD19 isolated from K46 cells that were stimulated through the BCR exhibited inducible tyrosine phosphorylation (Fig. 5⇓). As was observed in the case of CD22, class II cross-linking resulted in phosphorylation of CD19 on tyrosine residues within 1 min. These results clearly demonstrate that BCR- and class II-dependent signaling leads to comparable inducible tyrosine phosphorylation of the coreceptors CD19 and CD22. Cross-linking of class II results in tyrosine phosphorylation of CD22. K46 cells (2.5 × 107/sample) were stimulated either by cross-linking the BCR or class II. Cells were incubated with biotinylated anti-class II mAb (Anti-Ia, D3.137.5.7, 20 μg/ml) or medium alone, after which they were washed. To induce signaling through class II, cells incubated with anti-class II mAb were stimulated by the addition of NeutrAvidin (20 μg/ml). To induce signaling through the BCR, cells incubated in medium alone were stimulated by the addition of F(ab′)2 of goat anti-mouse IgG/A/M (5 μg/ml). As a positive control, cells were incubated with pervanadate to induce tyrosine phosphorylation of CD22 in a receptor-independent manner. CD22 was immunoprecipitated from precleared lysates by the addition of Sepharose 4B beads conjugated with anti-CD22 mAb (CY34.1). After boiling, the beads in SDS-PAGE sample reducing buffer, the proteins contained in 15 μl of supernatant were separated on 8% acrylamide gels using SDS-PAGE and transferred to Hybond-ECL nitrocellulose membranes. The membranes were blocked in 3% blot qualified BSA and subsequently incubated with HRP-conjugated anti-phosphotyrosine mAb (4G10, 1:3000). The proteins were visualized using ECL. Cross-linking of class II results in tyrosine phosphorylation of CD19. K46 cells (2.5 × 107/sample) in IMDM supplemented with 5% FCS were stimulated either through the BCR or class II as previously described. 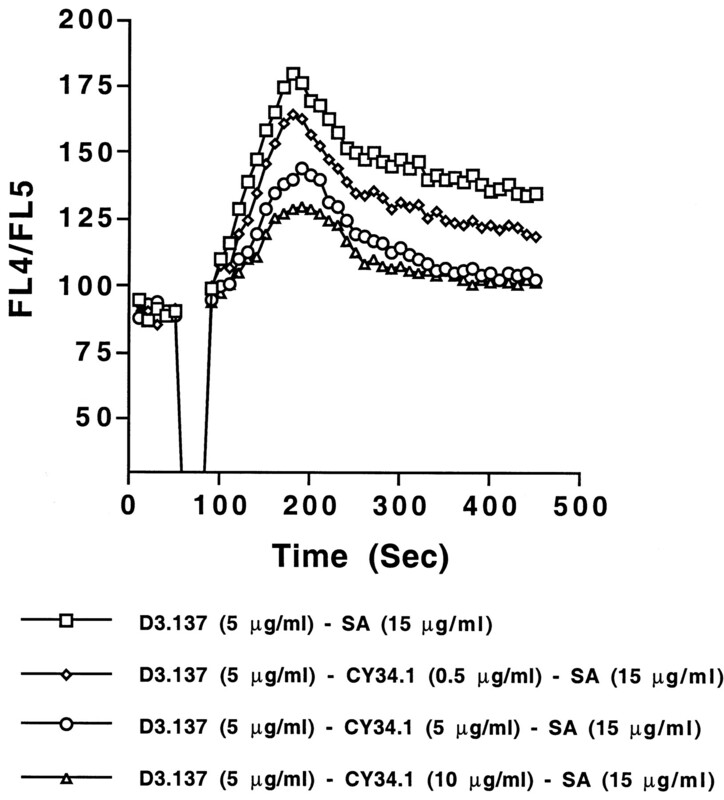 After stimulating cells for varied periods of time, they were lysed in detergent-containing buffer and CD19 was immunoprecipitated from the precleared lysates by the addition of soluble anti-CD19 mAb (1D3, 15 μg/ml) and protein G-conjugated Sepharose beads. The immune-complex proteins were separated on 8% acrylamide gels using SDS-PAGE and transferred to Hybond-ECL nitrocellulose membranes. The membranes were blocked in 3% blot qualified BSA, washed 5 times in TBST, and incubated with HRP-conjugated anti-phosphotyrosine mAb (4G10, 1:3000). The proteins were visualized using ECL. Previous studies have demonstrated that BCR-dependent tyrosine phosphorylation of CD19 and CD22 plays a direct role in their function as coreceptors through the generation of phosphotyrosine motifs in their respective cytoplasmic domains that recruit SH2 domain-containing effector proteins (39, 40, 41, 42, 43, 44). Thus, it was of interest to determine whether class II-mediated phosphorylation of CD19 and CD22 promotes the recruitment of effector proteins that might be involved in modulation of class II signaling. Toward this end, K46 cells were stimulated either by cross-linking the BCR with polyclonal anti-mouse Ig or with biotinylated anti-class II mAb and NeutrAvidin for various periods of time. Subsequently, CD22 was immunoprecipitated from cell lysates by incubation with anti-CD22 mAb conjugated to Sepharose 4B beads. The immune complexes were resolved by SDS-PAGE and analyzed by Western blotting with anti-phosphotyrosine mAb to confirm inducible tyrosine phosphorylation of CD22 (Fig. 6⇓, upper panel). The blot was stripped and reprobed with anti-SHP-1 mAb before the addition of goat anti-mouse Ig secondary Ab conjugated with HRP. Tyrosine phosphorylation of CD22 in response to BCR cross-linking resulted in the recruitment of the PTP SHP-1 (Fig. 6⇓, lower panel). In parallel samples, tyrosine phosphorylation of CD22 isolated from cells stimulated through class II was associated with inducible recruitment of SHP-1 as well. Increased association of SHP-1 with CD22 was detectable within 1 min in both BCR and class II-stimulated cells; however, the interaction appeared to be more transient in response to class II cross-linking. Thus, the functionally relevant effector protein SHP-1 is indeed recruited to CD22 in response to both BCR- and class II-mediated phosphorylation. Tyrosine phosphorylation of CD22 in response to class II signaling induces recruitment of SHP-1. K46 cells (2.5 × 107/sample) in IMDM supplemented with 5% FBS were stimulated either through the BCR or class II as previously described. CD22 was immunoprecipitated from precleared lysates by the addition of Sepharose 4B beads conjugated with anti-CD22 mAb (CY34.1). The immune-complex proteins from each sample were separated on 8% acrylamide gels using SDS-PAGE and transferred to Hybond-ECL nitrocellulose membranes. The membranes were blocked in 3% blot qualified BSA, washed five times in TBST, and incubated with HRP-conjugated anti-phosphotyrosine mAb (4G10). Tyrosine phosphorylation of CD22 was visualized using ECL. The blot was then stripped of Ab and washed repeatedly in TBST. The membrane was blocked in 10% nonfat dry milk and subsequently incubated with anti-SHP-1 mAb (1:250) followed by incubation with HRP-conjugated goat anti-mouse IgG. The association of SHP-1 with CD22 was visualized using ECL. Upper panel, Analysis of CD22 tyrosine phosphorylation in K46 cells stimulated through the BCR or class II. Lower panel, Inducible association of SHP-1 with CD22 in response to BCR- or class II-mediated tyrosine phosphorylation of CD22. The basic experiment described above was repeated and the cell lysates were split into three equal aliquots. Immunoprecipitation of CD19 was then performed by incubating each sample with soluble anti-CD19 mAb and the resultant immune complexes were recovered by incubation with Sepharose beads conjugated to protein G. The immune-complex proteins for each set of aliquots were separated by SDS-PAGE, and one set of aliquots was analyzed by anti-phosphotyrosine Western blotting to confirm that CD19 was inducibly phosphorylated on tyrosine (Fig. 7⇓A). 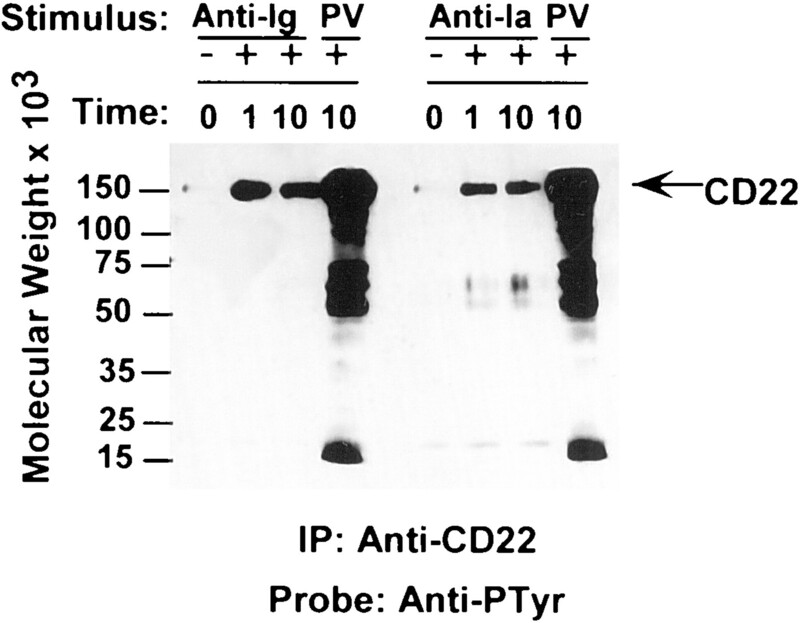 The duplicate aliquots were probed with either anti-Vav or anti-PI 3-K mAb. 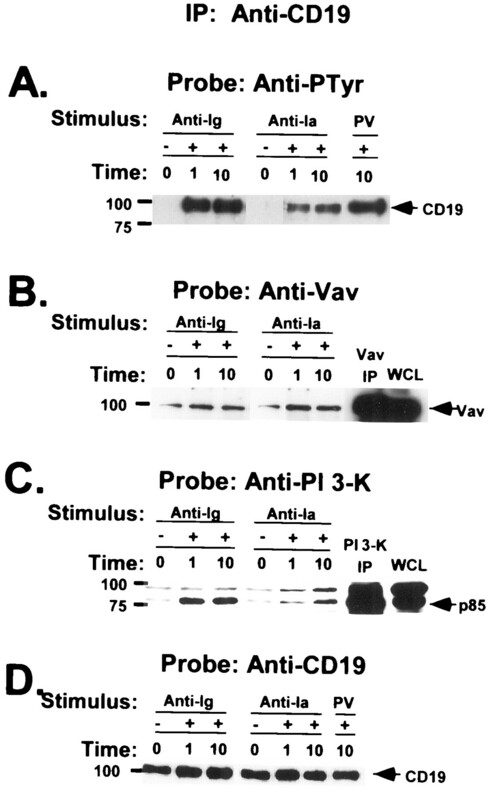 Following incubation of the blots with the appropriate primary Ab they were incubated with goat anti-mouse Ig Ab conjugated to HRP, and ECL development was used to detect Vav or PI 3-K (Fig. 7⇓, B and C, respectively). To ensure equal loading of CD19, the individual blots were stripped and reprobed with anti-CD19 mAb and ECL was used to visualize CD19 (Fig. 7⇓D). Thus, as can be seen in Fig. 7⇓, tyrosine phosphorylation of CD19 in response to class II ligation resulted in the recruitment of effector proteins known to have a positive influence on BCR signaling. Class II-mediated tyrosine phosphorylation of CD19 promotes the recruitment of Vav and PI 3-kinase. K46 cells (2.5 × 107/sample) were stimulated through the BCR or class II as previously described. Lysates were separated into triplicate aliquots and CD19 was immunoprecipitated with soluble anti-CD19 mAb (1D3, 15 μg/ml) and Sepharose beads conjugated to protein G. The immune-complex proteins in each sample were separated on 8% acrylamide gels using SDS-PAGE and transferred to Hybond-ECL nitrocellulose membranes. A, Detection of CD19 tyrosine phosphorylation. The membranes were blocked in 3% blot qualified BSA and were subsequently incubated with HRP-conjugated anti-phosphotyrosine mAb (4G10) (1:3000). B, Recruitment of Vav to tyrosine phosphorylated CD19. The immunoblots were blocked in 10% nonfat dry milk, incubated with anti-Vav mAb (1:250), and then incubated with HRP-conjugated goat anti-mouse IgG (1:10000). C, Recruitment of PI 3-kinase to tyrosine phosphorylated CD19. The immunoblots were blocked in 10% nonfat dry milk, incubated with anti-PI 3-kinase mAb (1:300), and then incubated with HRP-conjugated goat anti-mouse IgG (1:10000). D, Confirmation of equal loading of CD19. Selected blots were stripped and then blocked in 10% nonfat dry milk. The blots were next incubated with mouse anti-CD19.cyto mAb (1:1000), washed and then incubated with HRP-conjugated goat anti-mouse IgG (1:10000). The protein bands on all blots were visualized using ECL according to the manufacturer’s instructions. Data obtained from the previous experiments demonstrated that tyrosine phosphorylation of CD19 and CD22 following class II ligation results in the recruitment of specific effector proteins that are known to modulate signal transduction via the BCR. However, it remained to be determined whether CD19 and CD22 could indeed affect class II signaling through the recruitment of these effector proteins. Thus, experiments were designed to investigate this possibility in which the effect of coligating either CD19 or CD22 with class II was assessed by monitoring calcium mobilization. K46 cells loaded with Indo-1 were incubated with a suboptimal concentration of biotinylated anti-class II mAb in the presence or absence of varying concentrations of biotinylated anti-CD22 mAb. Unbound Ab was removed by washing and the basal concentration of intracellular free Ca2+ was measured. Next, the cells were stimulated by the addition of NeutrAvidin to cross-link class II alone or to effect co-cross-linking of CD22 and class II. Coligation of CD22 with class II resulted in a reproducible decrease in calcium mobilization that was dependent on the concentration of anti-CD22 mAb used when compared with the response generated by class II ligation alone (Fig. 8⇓). Thus, SHP-1 recruitment by CD22 appears to exert a negative effect on class II signaling in a manner similar to that observed for BCR signaling. Coligation of CD22 with class II attenuates calcium mobilization induced by class II cross-linking. K46 B cells (1 × 106/ml) were loaded with Indo-1 AM at a final concentration of 5 μm. Before analysis, cells were incubated with varying amounts of biotinylated anti-CD22 mAb (CY34.1, 0.5–10 μg/ml) and a suboptimal amount of biotinylated anti-class II mAb (D3.137, 5 μg/ml). Additional samples were incubated in the presence of biotinylated anti-class II mAb alone. The basal concentration of intracellular free Ca2+ was measured for all samples just before stimulation, after which NeutrAvidin (15 μg/ml) was added either to ligate class II alone, or to coligate class II with CD22. The effect that coligation of CD19 has on class II signaling was assessed by repeating the experiment described above using Indo-1-loaded K46 cells and substituting biotinylated anti-CD19 mAb for the biotinylated anti-CD22 mAb. Coligation of CD19 with class II, via the addition of NeutrAvidin, resulted in a significant increase in calcium mobilization when compared with class II ligation alone (Fig. 9⇓). Because CD19 ligation alone can lead to calcium mobilization it was important to determine whether the increase was simply an additive effect between class II- and CD19-dependent signals. Therefore, K46 cells, which had been incubated with biotinylated anti-CD19 mAb alone, were analyzed to determine the calcium mobilization response upon CD19 cross-linking by NeutrAvidin. The results demonstrated that stimulation of K46 cells through CD19 alone does not result in appreciable calcium mobilization (Fig. 9⇓). Thus, recruitment of Vav and PI 3-K by CD19 appears to positively influence class II signaling in a manner similar to that for the BCR. Coligation of CD19 with class II enhances calcium mobilization in response to class II cross-linking. K46 B cells (1 × 106/ml) were loaded with Indo-1 AM at a final concentration of 5 μm. 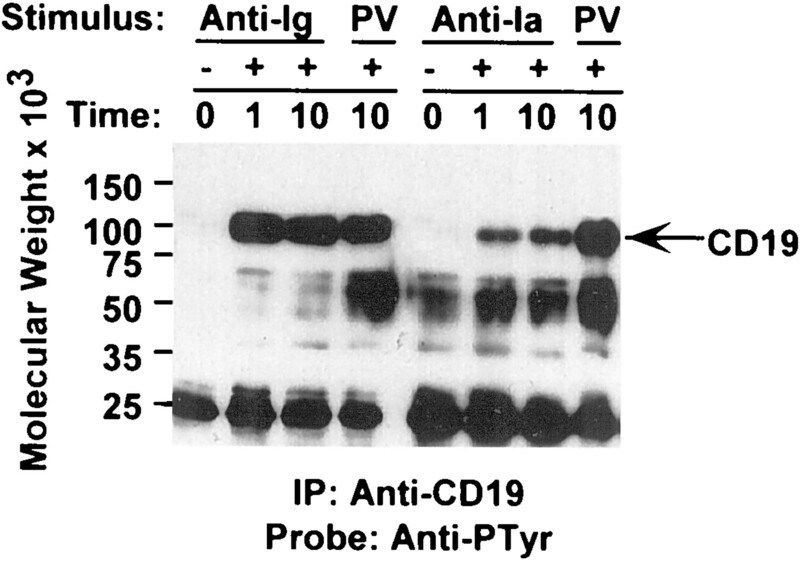 Before analysis cells were incubated with a suboptimal amount of biotinylated anti-class II mAb (D3.137, 5 μg/ml) and/or varying amounts of biotinylated anti-CD19 mAb (1D3, 0.5–10 μg/ml). Additional samples were incubated with anti-class II mAb alone as described above. The basal concentration of intracellular free Ca2+ was measured for all samples just before stimulation, after which NeutrAvidin (15 μg/ml) was added either to ligate class II or CD19 alone, or to coligate class II with CD19. Parallel experiments were performed in which resting splenic B cells were incubated in the presence of anti-IgM mAb and IL-4 as previously described (23) to prime the cells. Subsequently, the primed B cells were loaded with Indo-1 and analyzed as described above to confirm that CD22 and CD19 modulate class II signaling in a manner analogous to that observed using K46 cells. As can be seen in Fig. 10⇓, co-cross-linking CD22 with class II attenuates the Ca2+ response whereas CD19 was observed to enhance Ca2+ mobilization. These results confirm the previous findings with K46 cells and support the hypothesis that CD22 and CD19 are involved in modulating class II signal transduction. Coligation of either CD22 or CD19 with class II expressed on primed splenic B cells results in modulation of the Ca2+ mobilization response. Resting splenic B cells were incubated in the presence of anti-IgM mAb (Bet-2, 10 μg/ml) and IL-4 (100 U/ml) for 16 h at 37°C. Primed B cells (1 × 106/sample) were then loaded with Indo-1 and incubated with the appropriate mAbs to effect cross-linking of class II alone or in conjunction with either CD22 or CD19 (see figure legends 8 and 9). Analysis of Ca2+ mobilization was performed as previously described. As a negative control, resting splenic B cells that had not been primed with anti-IgM and IL-4 were stimulated through class II. Previous studies have documented similarities in the signal transduction pathways associated with the BCR and MHC class II. In the current study, experiments were conducted demonstrating that the BCR and class II are coupled to signaling pathways that are functionally related based on the ability of these receptors to reciprocally desensitize one another. Additionally, signaling via class II was shown to induce phosphorylation of both CD19 and CD22 resulting in the recruitment of SH2 domain-containing effector proteins known to play a role in the function of these coreceptors. 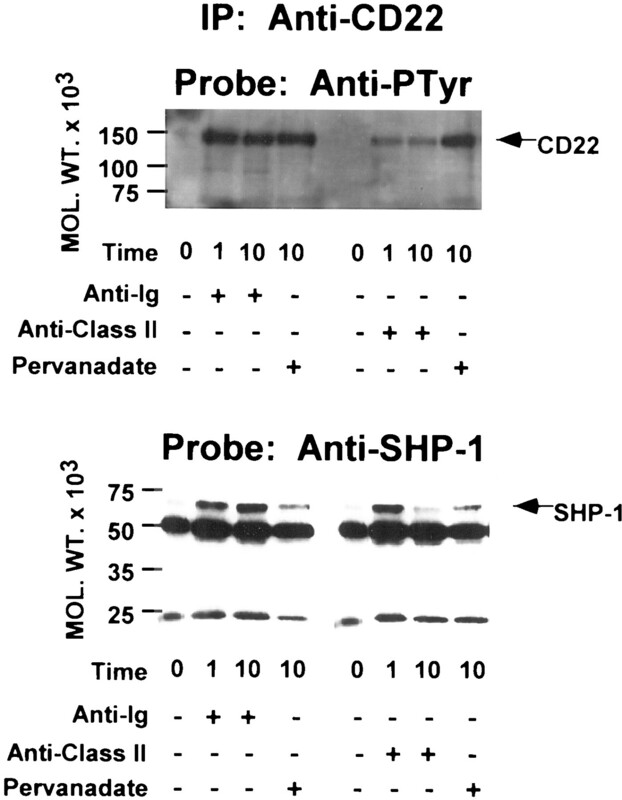 Class II-mediated signaling promoted the recruitment of SHP-1 to CD22 in a phosphorylation-dependent manner, and coligation of these receptors resulted in attenuation of class II signaling. Alternatively, phosphorylation of CD19 in response to class II cross-linking promoted the recruitment of Vav and PI 3-kinase, which potentiated class II signaling in response to coligation with CD19. These studies further support the hypothesis that the BCR and class II transduce signals via a common molecular mechanism based on the ability of CD19 and CD22 to regulate signal transduction via both receptors in a similar manner. Because class II is constitutively coupled to the PTK-dependent signaling pathway in the K46 cell line, these cells constitute a suitable model in which it is possible to test whether BCR- or class II-mediated signaling results in heterologous desensitization of the other receptor. That the BCR and class II do indeed exhibit the ability to mediate reciprocal desensitization of one another, suggests that these receptors are coupled to signaling pathways that are functionally linked and therefore share common processes and/or elements. Reciprocal desensitization was observed within 10–15 min after stimulation of K46 cells through either the BCR or class II suggesting that desensitization results from alterations in receptor-proximal events. This is supported by the observation that desensitization of both the BCR and class II is associated with an inability to detect inducible protein tyrosine phosphorylation upon receptor cross-linking (data not shown). Previous studies have shown that BCR desensitization is correlated with uncoupling of the Ag recognition component (membrane Ig) from the signal transducing element comprised of Ig-α and Ig-β (50). Thus, desensitization of the BCR appears to be mediated by physical uncoupling of the receptor from intracellular membrane-proximal effector proteins (i.e., PTKs). Structure/function studies have demonstrated that the ability of class II to activate PTKs and to mediate calcium mobilization is dependent on conserved regions within the transmembrane domains of both the class II α- and β-chains (1, 25, 28, 29, 30, 31). This, in turn, suggests that coupling of class II to intracellular effector proteins is mediated through its association with a transmembrane intermediate transducer element(s), analogous to the way the BCR propagates a signal through its interaction with Ig-α/Ig-β. Thus, it is possible that cross-linking of the BCR promotes uncoupling of class II from an associated transducing element thereby inhibiting its ability to propagate a signal. Conversely, transduction of a signal via class II could result in desensitization of the BCR by causing it to dissociate from the Ig-α/Ig-β heterodimer. Because the BCR and class II signaling pathways appear to use common effector proteins such as Lyn and Syk, an alternative explanation for the observed heterologous desensitization could be due to the fact that these receptors compete with one another for recruitment of essential effector proteins. In conclusion, although these studies do not confirm that the BCR and class II actually regulate the function of one another under physiological conditions in normal B cells, they do support the hypothesis that both receptors transduce signals via similar mechanistic processes. Because class II signaling appears to be mediated by a mechanism that shares numerous similarities with the BCR, it was logical to hypothesize that class II signaling may be modulated by coreceptors, as well. BCR signaling is regulated by coreceptors including CD19 and CD22, which exert opposite effects on the magnitude and duration of the signal, thereby effectively decreasing or increasing the threshold of stimulus required to drive a response, respectively. Although CD22 and CD19 play an important role in regulating BCR signaling, studies have not previously examined the possibility that either is involved in regulating signal transduction via other surface receptors expressed by the B cell. The results presented herein demonstrate that CD19 and CD22 differentially modulate class II-mediated calcium mobilization. However, the physical/functional nature of the relationship between class II and these coreceptors has yet to be elucidated from a physiological perspective. Based on the available evidence relating to class II signaling in murine B cells, CD19 and CD22 would presumably be involved in modulation of class II signaling in primed B cells in which class II is functionally coupled to the activation of PTKs, phosphoinositide hydrolysis, and Ca2+ mobilization. CD22 is a sialoadhesin that recognizes sialic acid in the natural structure Siaα2–6Galβ1–4GlcNAc (α2, 6-linked sialic acid) (51, 52). Because class II is a sialylated glycoprotein it may function as a ligand for the extracellular sailoadhesin domain of CD22 (53, 54). As class II is constitutively sialylated, CD22 might be important for attenuation of class II signals by virtue of its ability to constitutively interact with class II. This would presumably prevent aberrant activation/differentiation of primed B cells until such time as they encounter appropriate T cell-derived signals. B cells that have processed and presented Ag in the context of class II could transduce a productive signal in response to class II cross-linking by an Ag-specific CD4+ T cell if the interaction between class II and CD22 is effectively disrupted. In this regard, it is possible that class II may be sequestered away from CD22 via one or more mechanisms. For example, class II has been shown to associate with glycolipid-enriched microdomains (GEM) in response to ligation (32) and this might physically release it from CD22-mediated repression. It is equally possible that contact with CD4+ T cells could promote the formation of intercellular bonds mediated by binding of CD22 to sialylated proteins on the T cell. For example, previous studies have demonstrated that CD22 binds to CD45 on T cells (55, 56). The formation of an intercellular bond between CD22 and CD45 or some other sialoglycoprotein could conceivably displace class II from CD22 on the B cell. Alternatively, studies have demonstrated that the expression of α2,6-sialyltransferase in B cells is cell cycle dependent and that a B cell-specific α2,6-sialyltransferase promoter is up-regulated during B cell activation (57, 58). Increased expression and/or activity of α2,6-sialyltransferase in activated B cells could lead to increased sialylation of CD22, which has been shown to inhibit the ability of CD22 to bind to other α2,6-linked sialic acid containing proteins (59). Alternatively, up-regulation of α2,6-sialyltransferase could promote sialylation of other surface proteins that compete with class II for binding to CD22. The net effect would be to disrupt the interaction between class II and CD22 thereby potentiating class II signaling. With regard to the interaction between class II and CD19, several studies have shown that CD81, a constituent of the CD19/CD21 multimeric signaling complex, physically interacts with class II (60, 61, 62). Through its interaction with the CD19/CD21 complex, CD81 could potentially link CD19 to class II indirectly and in this way, class II signaling could be enhanced through the recruitment of effector proteins to CD19. Although studies have shown that the interaction between class II and CD81 in resting cells involves only a limited fraction of the total cellular pool of the relevant molecules (60), CD81 and class II have nevertheless been demonstrated to undergo cocapping in response to ligation of class II (61). Thus, TCR/CD4-dependent cross-linking of class II on the surface of the B cell, leading to its recruitment into GEMs, could lead to colocalization of CD19 through the class II-CD81 interaction. The net effect would be to focus CD19 in GEMs containing PTKs, where it would be phosphorylated, thereby promoting the recruitment of positive signaling effectors such as Vav and PI 3-K that would then serve to amplify signals delivered via class II. In conclusion, it has clearly been demonstrated that class II-mediated signals synergize with other signals received via molecules such as CD40 (63). Specifically, class II-dependent signaling enhances, in an Ag-specific manner, the responsiveness of B cells to subsequent T cell help that is provided by the nonpolymorphic binding of CD40L to CD40 (63). Thus, prior stimulation through the BCR and class II ensures that Ag-specific B cells respond preferentially to ILs and T cell help. In this regard, it would be important to ensure that aberrant class II-dependent signals cannot be propagated in primed B cells unless those cells encounter appropriate Ag-specific T helper cells. The putative constitutive interaction between class II and CD22 could in fact attenuate class II signaling in the absence of cognate T-B interactions. Conversely, CD19 may be important for potentiating class II signaling to promote B cell responsiveness to subsequent CD40-dependent signals. This would facilitate the delivery of an optimal signal that promotes B cell proliferation, differentiation and isotype switching. Because CD19 and CD22 have the potential to modulate class II signaling, it is formally possible that they play an important role not only in regulation of B cell activation, but differentiation and isotype switching as well. We thank Dr. R. H. Carter for supplying the anti-CD19.cyto mAb and Dr. M. Reth for allowing us to use the K46-17μmλ cell line. ↵1 This work was supported by Grant AI36401 from the National Institutes of Health. ↵3 Abbreviations used in this paper: class II, MHC class II; PTP, protein tyrosine phosphatase; BCR, B cell Ag receptor; PKC, protein kinase C; PTK, protein tyrosine kinase; PLCγ, phospholipase Cγ; IP3, 1,4,5-inositol trisphosphate; PI 3-K, phosphatidylinositol 3-kinase; ECL, enhanced chemiluminescence; GEM, glycolipid-enriched microdomain.